Today’s post is another that highlights previously completed projects. And my love of red. So this cabinet was created from two upper kitchen cabinets. It was easy to connect them side-by-side and added some trim around the bottom. I debated whether to try and match my kitchen cabinets and figured that I would never get it to match, the kitchen cabinets are an ash wood and a light finish and the cabinets that I bought were a pine base. And of course the floors are a medium oak hardwood. So, I started thinking about painting them to match my choice of accessories in the kitchen: “Kitchenaide Red”. I’ve never been one to be afraid to use bold colors. 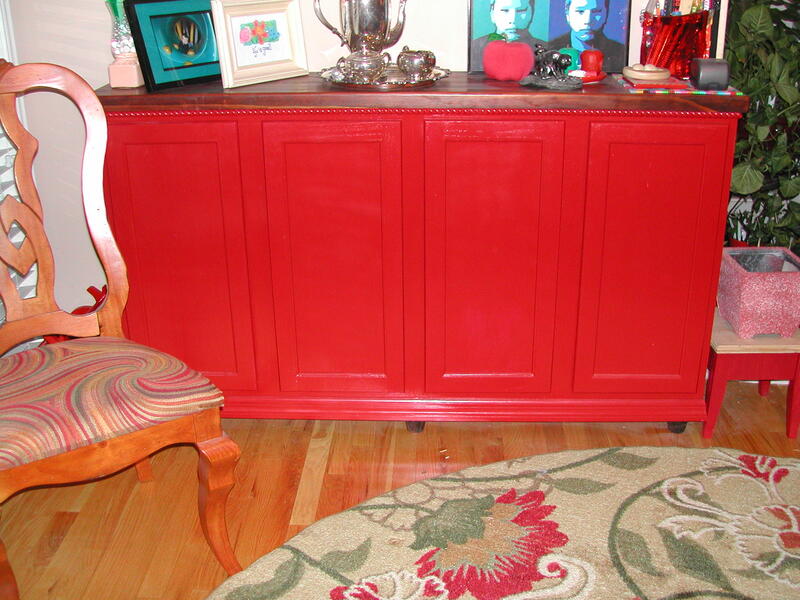 First, I primed the cabinets and then painted with two coats of the color. Then it came to the top. I didn’t want to use the same Formica countertops that were used in the kitchen (someday I will be replacing those countertops as well). So, I opted to create a wood top, since a solid piece of wood would be very expensive. I used 2×2 pieces of wood and attached them together. I sanded the top and then routed the edges gently for a rounded edge. I used a combination of walnut and oak stains (leftovers from other projects) and it came out very beautiful. Used the stain on the feet as well (picked them up at Home Depot). To hide a little unevenness I bought and painted some ‘rope’ trim under the top. LOVE the way it turned out. 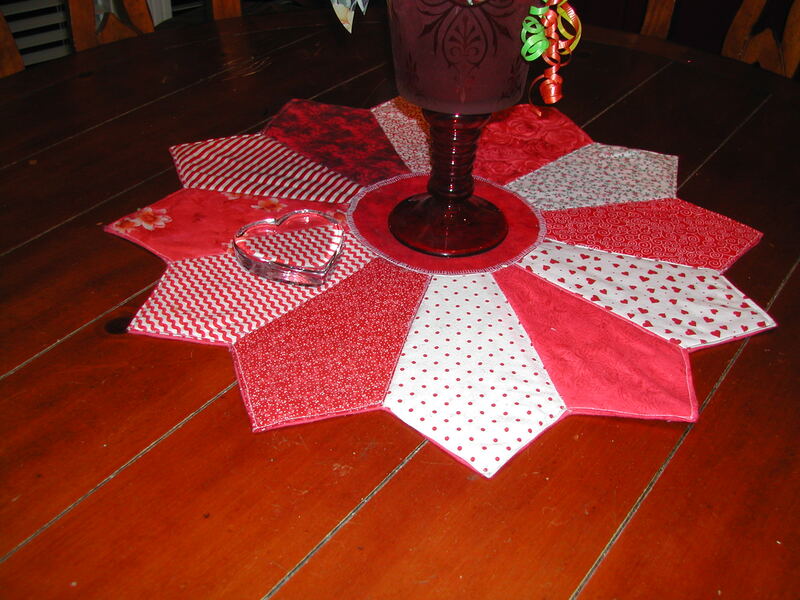 This is a simple table topper that I made out of red and white fabrics that I had in my stash. It’s a simple quilt pattern called “Dresden Plate”. It is lined with red felt and I used a satin stitch on the seams to finish it. Sits in the middle of my round table with a beautiful red vase. The table is never this clear… it becomes the place where everything gets set before it gets put away (and sometimes it takes day or weeks to get put away). 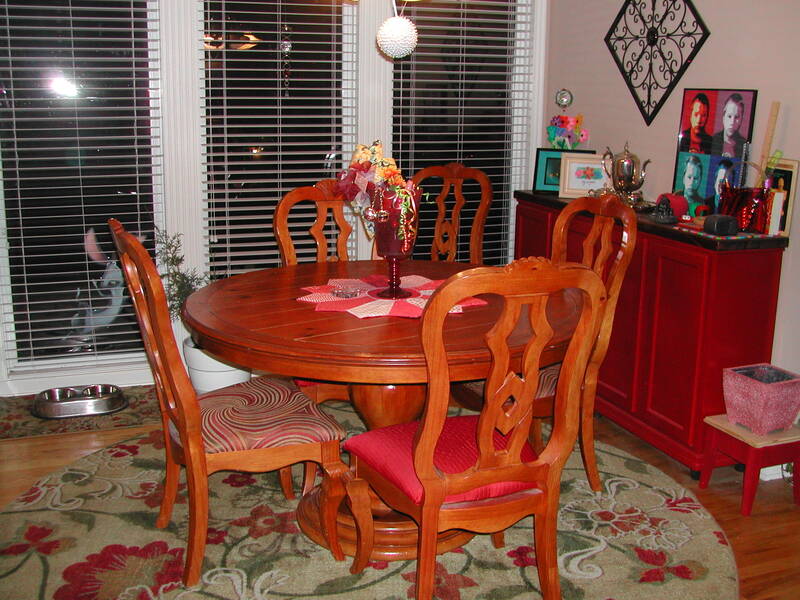 This is a larger view of my dining area in all its red glory. I recovered the chairs with fabric that matches the pillows that came with the sofa and oversize chair in the living room. Over next to the sideboard is a stool the Kid built me in shop class in high school. Of course painted in the same Kitchenaide Red” (haven’t gotten around to staining the top to match, the problem with custom stain creations). 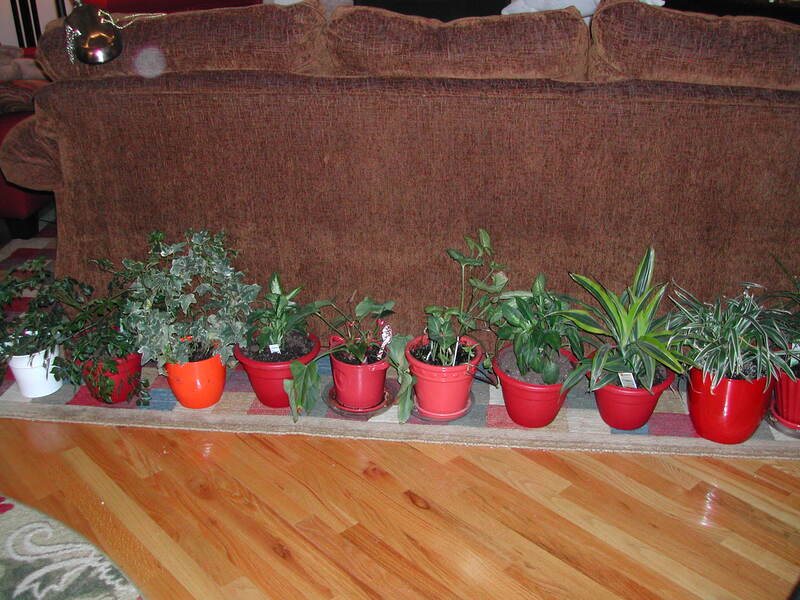 I spent a few hours last weekend re-potting my house plants. Most of them are cuttings from existing plants or from runners. I have a green thumb without even trying and I tend to get overrun with houseplants. I try to give them away occasionally, honestly, I don’t like the amount of time it requires taking care of them. But I like the ‘life’ that it brings to the house. I want to put up a shelf across the picture windows and get them up off the floor. So far, I have been lucky that the dog stays out of them. And yes, I have one orange one, breaks up the monotony. Makes me think of someone special, too. It seems that I have about a hundred projects started, and need to work on getting some of them finished. I hope you are enjoying this journey so far. I hope you come back again.